The teachers, especially, became a reactionary force when it came to school reform — opposing charter schools (in Detroit, the union blocked a $125 million private contribution to build five new charter schools) and merit pay; they lashed themselves to strict seniority rules more appropriate to assembly-line workers than would-be professionals. New York City Mayor Michael Bloomberg has been trying to negotiate a deal whereby layoffs, if necessary, would not be made on a last-hired, first-fired basis. “So you’d rather have them lay off the more experienced teachers?” a Wisconsin teacher asked me. No: teachers should be hired and fired and paid according to their ability. “But who judges that?” the teacher asked. Their employers do, I replied. The teacher scoffed; the idea that school principals should be able to decide who should be part of their workforce seems incomprehensible to most teachers — and yet that sort of accountability is at the heart of any system that aspires to excellence. 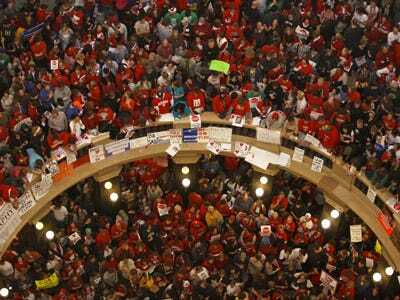 The strongest arguments against public employees’ unions lie there: in their power to block reform and strangle good governance. Clearly, there needs to be a rebalancing of pension and health care benefits that puts public employees more in line with the conditions that prevail in the private sector. But those changes must be accompanied by the recognition that a great many public employees are severely underpaid. This is especially true at the federal level, where the scientists testing drugs at the U.S. Food and Drug Administration or the bank regulators at the SEC could probably double their salaries by sliding into the private sector. And it’s also true at the very bottom of the wage scale, for the school-bus drivers and home health care workers. The best rationale for the continued existence of public employees’ unions is to create wage floors for such workers. But the unions have set about, largely unimpeded, to build walls (work rules) that constrict government innovation and ceilings (like opposition to merit pay) that make it less likely that the most talented professionals will remain in public service.